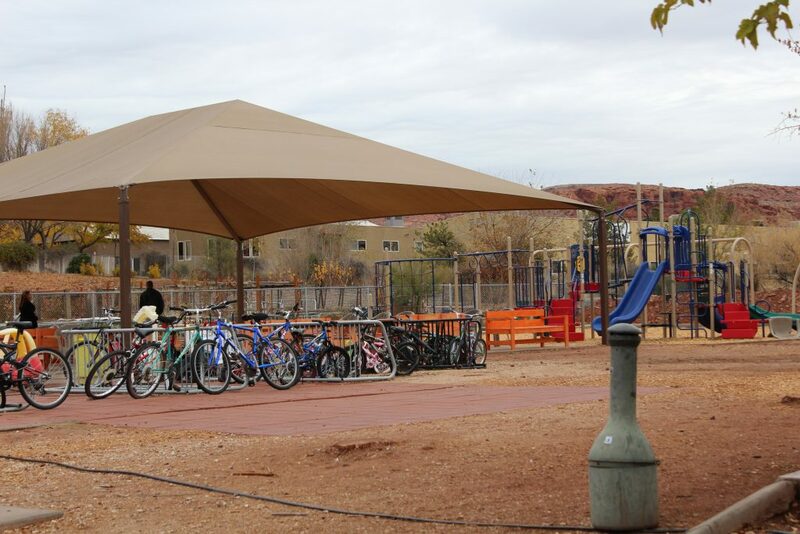 ST. GEORGE — What was once a barren dirt lot in the back of Switchpoint Community Resource Center has been transformed into a place of smiles and laughter due in part to a grant and generous donations from local businesses. 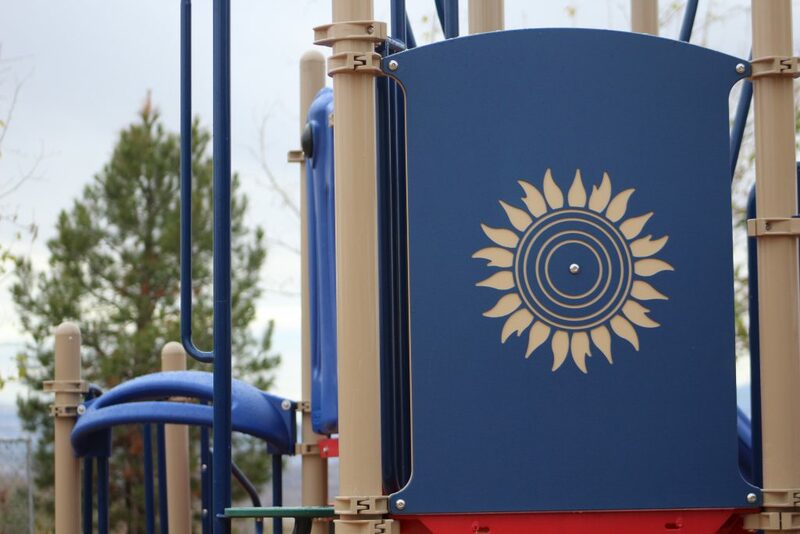 Community leaders joined Switchpoint executives and a few members of the public at a small but joyous ribbon-cutting of their new playground and family area on a cloudy Thursday morning, giving residents and visitors another way to make the facility feel like a home. 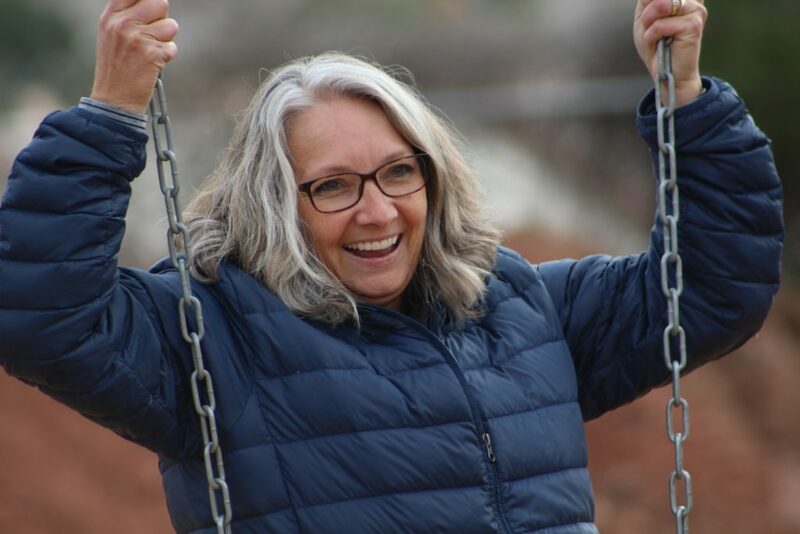 Linda Stay, director of development at Switchpoint told St. George News that since they opened the facility four years ago the goal has always been been to create a great play area in the back of their dirt lot and they were elated when the opportunity came up to write a grant for the project. 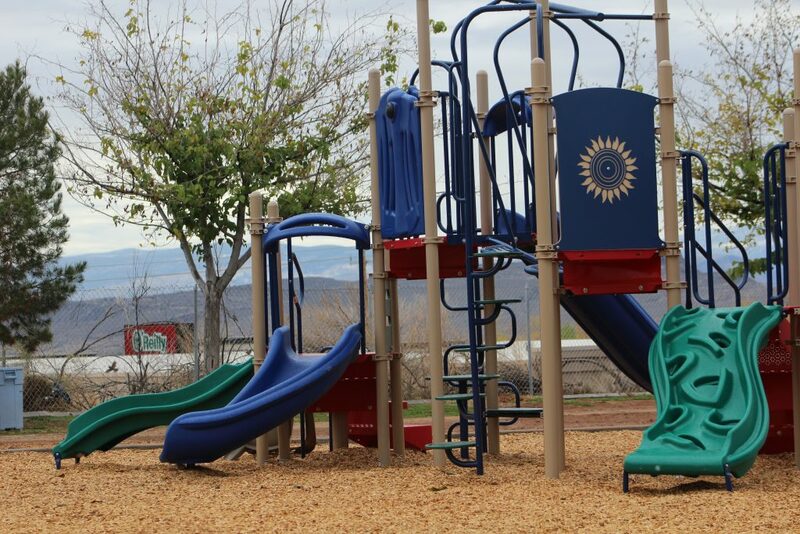 Funds totaling $60,000 finally came through from Lowe’s for the playground in August. 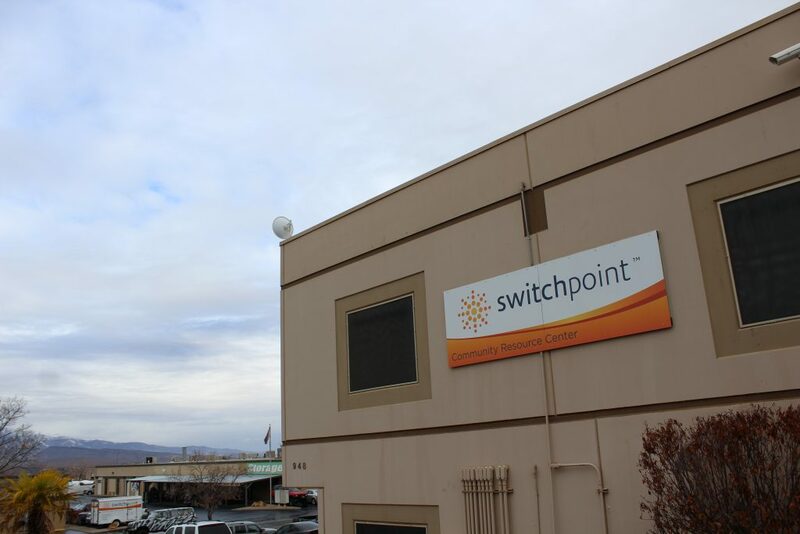 Switchpoint strives to be a steppingstone toward independence and provides temporary shelter and support for the homeless community in Washington County. The nonprofit center can house 84 people and has five different family rooms enabling loved ones to stay together. Even a couple of single mothers are able to share a room, allowing them a safe space for their kids. Manager of the River Road location of Lowe’s, Ben Kohler, said the playground turned out better than they ever could have dreamed when they started talking about it two or three years ago. 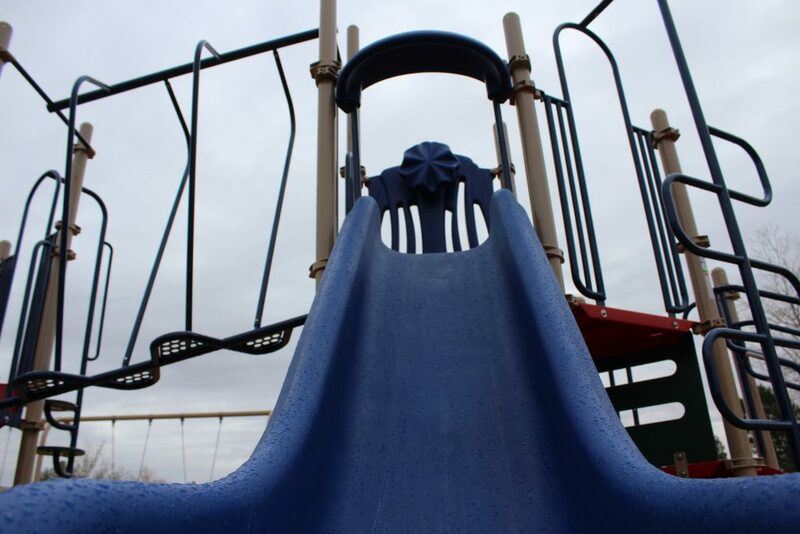 St. George Mayor Jon Pike agreed, saying the new playground is really awesome and vowing help from the city to help finish the project’s landscaping. He said Switchpoint is an incredible organization and it is a privilege for the city to work with them. Phase one of the play area was to finish a complete playground with curbs and 18″ of soft landscaping bark to cushion any falls, but with the city of St. George’s help and another $15,000 donation from Dominion Energy, the project can be finished with grass, trees and a rolling bike trail circling the area . 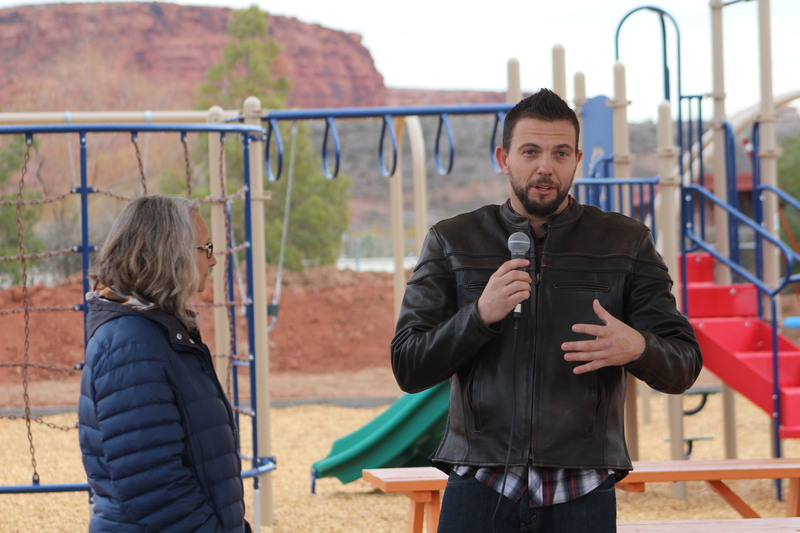 “We do get a lot of kids that visit our food pantry as well,” Hollowell told St. George News after the ceremony, adding that the center wants to make sure it can accommodate as many children as possible. She said the future bike path will be great for the kids to ride their little trikes around. David Dangerfield, chairman of the board of directors for Switchpoint, said the center is privileged to have the contributions of the energy company and also from Lowe’s. Switchpoint relies on community support and it’s especially important this time of year. Hollowell said of course cash is always king for the organization and it is probably the best way for donors to get the most bang for their buck when giving this holiday. She said Switchpoint can leverage dollars with other grants, making more projects like this possible and enable them to help the most. “It’s just really hard to serve as many people as we do if we can’t finance it,” Hollowell said. Donations can me made in person at Switchpoint located at 948 N. 1300 West, St. George or on its website. Perhaps the mayor could have stepped out of the spotlight for a moment and in his place have the manger from Lowe’s assist in the ribbon cutting. At least, for now, this wasn’t taxpayer money and hats off to Lowe’s. It all looks good. Also looks like the Mayor is about to lose a finger!